“Juno,” a U.S. film about a teenage girl who gets pregnant and tries to find a couple to adopt her baby, won best film Saturday at the Rome Film Festival. The best actress award went to Chinese actress Jang Wenli for “Li Chun” (And the Spring Comes), about a provincial opera singer who dreams of becoming the star of the Beijing Opera in the years between the end of the Cultural Revolution and the Tiananmen Square uprising. Rade Serbedzija of Croatia won best actor for his role in the Canadian-Greek production “Fugitive Pieces.” In the film, he plays Athos, a Greek archaeologist who saves a Jewish child from Poland who is orphaned during World War II. Canadian filmmaker Jason Reitman’s “Juno” tells the story of Juno (Ellen Page), a Minnesota teenager who becomes pregnant and tries to decide what to do with the baby. It was first runner-up for the people’s choice award at last month’s Toronto International Film Festival. A 50-member public jury, made up of selected moviegoers from Italy and elsewhere in Europe, judged the in-competition films at the second annual Rome Film Festival. Bosnian director Danis Tanovic, who won the best foreign film Oscar with 2001’s “No Man’s Land,” presided over the jury. Posted by grhomeboy in Arts. Can’t get to Milan to see Leonardo Da Vinci’s masterpiece “The Last Supper?” > As of Saturday, all you need is an Internet connection. Officials put online an image of the “Last Supper” at 16 billion pixels, 1,600 times stronger than the images taken with the typical 10 million pixel digital camera. The high resolution will allow experts to examine details of the 15th century wall painting that they otherwise could not, including traces of drawings Leonardo put down before painting. The high-resolution allows viewers to look at details as though they were centimeters (inches) from the art work, in contrast to regular photographs, which become grainy as you zoom in, said curator Alberto Artioli. Besides allowing experts and art-lovers to study the masterpiece from home, Artioli said the project provides an historical document of how the painting appears in 2007, which will be valuable to future generations of art historians. The work, in Milan’s Church of Santa Maria delle Grazie, was restored in a painstaking effort that wrapped up in 1999, a project aimed at reversing half a millennium of damage to the famed artwork. Leonard painted the “Last Supper” dry, so the painting did not cleave to the surface in the fresco style, meaning it is more delicate and subject to wear. “Over the years it has been subjected to bombardments; it was used as a stall by Napoleon,” Artioli said. The restoration removed 500 years of dirt while also removing previous restoration works that masked Leonardo’s own work. Even those who get to Milan have a hard time gaining admission to see the “Last Supper.” Visits have been made more difficult by measures to protect it. Twenty-five visitors are admitted every 15 minutes to see the painting for a total of about 320,000 visitors a year. Visitors must pass through a filtration system to help reduce the work’s exposure to dust and pollutants. “The demand is three of four times higher, but we can’t accommodate it because of efforts to preserve the painting,” Artioli said. Three Romanian boxers were given lifetime bans after they were caught shoplifting in a Chicago department store during the World Amateur Championships. Marius Bogdan Dinu, 21, Ronald Gavril, 21, and Iulian Stan, 20, were caught on Friday and have been sent home, the Amateur International Boxing Association said. Posted by grhomeboy in Army Life, The Royals. Britain’s Prince William visits Royal Navy family members based in Helensburgh Scotland, on October 19 2007. 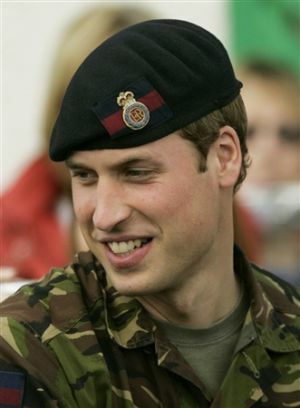 Britain’s Prince William smiles while visiting Royal Navy family members based in Helensburgh Scotland October 19 2007. LIMASSOL – Britain’s Prince Harry, along with 200 other army cadets, is being battle-trained in Cyprusprus before earning his pips as a British officer, military sources said Saturday. Harry, 21, is taking part in field exercise “Spring Victory” the final test in soldiering that cadets must undertake, after which they are assessed on their year of hard work before passing out from Sandhurst Royal Military Academy. The third in line to the thrown is expected to pass with flying colours and become a second lieutenant in the Household Cavalry after his final parade at Sandhurst next month. The two-week Cyprus exercise is a testing examination of stamina and being able to make the right decisions under fire. “This is a tough exercise which tries to recreate normal battle conditions. Cadets are burning up to 5,000 calories a day, sleeping three to four hours a day on average and they are put under very stressful condition,” a military source told AFP. There will be some time for relaxation but Harry can expect to trek up to 10 kilometres (six miles) a day in rugged terrain while living out of a tent, eating field rations and having only rudimentary washing facilities on hand. Moreover, Harry has carried out mock beach assaults, helicopter airlifts and dodged explosions. “They are all very tired but this is what happens in combat,” said the source. 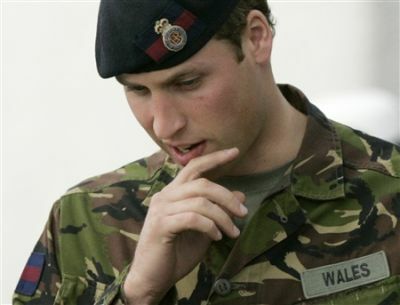 The army is also keen to point out that the prince is being treated like an “ordinary grunt”. “He’s doing very well and cracking on with it like everyone else. He is not treated any different and nobody would want it any other way,” said another army insider. He is going through exactly the same process and pain and the only thing different is that he’s not called by his surname,” he added. On his uniform and helmet, Harry is tagged as ‘officer cadet Wales’. He is doing the course on the British sovereign base of Episkopi on the southeast of the Mediterranean island where there is a large British garrison. The son of Prince Charles and the late Princess Diana has been on Cyprus for a week and his training is scheduled to last until March 31. He was last on the island in December to complete a Sandhurst-approved adventure course. That time he flew in from Heathrow under an assumed name on budget Cypriot airliner Helios. He was in full view of most people on board as there are no first class seats on the no-frills plane operated by Helios, which remains at the centre of controversy over the crash of one of its planes outside Athens last August that killed all 121 people on board. Britain’s Prince Harry has filmed an action-packed video about his tough army training. Camera crews filmed the young royal on a recent beach landing in Cyprus – where he is currently stationed. Clarence House plan to release the tape after 21-year-old Harry graduates from Sandhurst Military Academy next month. The video shows the prince landing on a beach on the Greek island, amid explosions and gunfire. The prince, along with 200 other army cadets, is being battle-trained in Cyprus before becoming a British officer. He is taking part in field exercise ‘Spring Victory’ – the final test in soldiering that cadets must undertake, before passing out from Sandhurst. Meanwhile Prince William’s girlfriend, Kate Middleton, has been invited to join the royal family at Harry’s passing out parade next month. It will be her highest-profile royal event yet. A family friend is quoted as saying: ‘Kate’s nervous but thrilled to have been asked.’ Harry’s long-term girlfriend Chelsy Davy has not been invited. PRINCE Harry is currently completing his final military exercise in Cyprus, along with over 200 other cadets, before earning his pips as a British Officer next month, a British Bases spokesman said yesterday. Harry, 21, is taking part in field exercise ‘Spring Victory’, the final test cadets must take in soldiering, after which they are assessed on their year of hard work before passing out from Sandhurst Royal Military Academy. The exercise is taking place across the Sovereign British Bases. According to Captain Crispin Coates, Spokesman for the British Bases, this is an infantry based exercise, based on different scenarios, where they must obey a number of international constraints. “This is their final exercise, before they are commissioned next month into the army as Officers. So it is very significant,” said Captain Coates yesterday. Oscar-winning Chinese musician Tan Dun said at an ongoing arts festival that he is going to employ “organic music”, produced by basic natural elements such as water and paper, in his rock-and-roll production for the 2008 Beijing Olympics, the ChinaDaily reports. The music, which is still in the middle of production, will make use of sounds in the movements of Chinese athletes, such as “sounds of water splashes by diver Guo Jingjing, ball hits by basketball player Yao Ming and race-starting of hurdler Liu Xiang”, Tan said at the 9th China Shanghai International Arts Festival that opened last Thursday. Tan, winner of the Grammy and Oscar awards for his soundtracks of “Crouching Tiger, Hidden Dragon”, had participated in music production for Beijing’s 2008 Olympic Bid Film. The native of central China’s Hunan Province is one of the musical planners for the opening ceremony, award granting ceremonies and a theme song for the Beijing Olympics. Tan earlier said his favorite athletes are diver Guo Jingjing, basketball player Yao Ming and hurdler Liu Xiang, who is world and Olympic champion in the men’s 110m hurdles. Tan said he could “sense musical tempos in their movements”. “They are natural sounds embodying sports passion, which are quite touching,” said Tan, adding that in his eyes the three are all musicians because he could “see colors and hear music in their movement rhythm”. Tan is currently testing his idea of bending these sounds of movement in rock music. It was said he had put microphones under the water of Shanghai Swimming Pool to record the sounds created by divers. “I often think of the scene around the Liuyang river in my hometown, people washing clothes in the river and the musicality of the sounds of water never cease,” Tan said, calling water “the tears of nature”. Tan acknowledged his idea of using water as an instrument originated from childhood memories. “This is sound from the nature, which could create different pictures in different hearts,” he said. At the ongoing arts festival, said to be the largest in China, Tan staged his “organic concerto of water and paper” created respectively on commission of the New York Philharmonic and Los Angeles Philharmonic for the opening of the Walt Disney Concert Hall. At the Water Concerto, percussionists drummed the surface of the water by hand or with glasses in a number of large, clear, transparent water basins on stage. They also used a range of instruments such as bowls, tubes, shakers, bottles and bells, which were immersed in the basins, and rhythmically rocked them to create “extraordinary sound effects”. Three Japanese percussionists drummed, tore, blew, shook, crumpled and slapped papers, cardboards, boxes, paper bags and paper umbrellas on the stage in the Paper Concerto, to show “how ordinary paper objects from daily life can create sounds of longing and suffering as well as loving”. Tan’s “organic music” attempt, beginning at the end of the 1980s, incorporates sounds and instruments from the natural world, water, wind, ceramics and paper, to create a new type of “experiencing music”, which also echoes traditional Chinese culture of “human life being in a highly harmony with nature”. Hosted by the Ministry of Culture and sponsored by the Shanghai Municipal Government, the China Shanghai International Arts Festival, which will run through a month, has become a major cultural gala and an artistic pageant.